If you're a little bit sad that the formerly popular freeware screenshot capture utility GrabClipSave has stalled development, you might be pleasantly surprised that Donationcoder has picked up the slack and released a similar program called Screenshot Captor. Except that unlike GrabClipSave, Screenshot Captor can do a whole lot more than any other free application we've seen thus far. It's basically a standard screen capture utility which takes screenshots of the current state of your Windows desktop. With Screenshot Captor, you can capture images from different parts of the screen including the currently active window, a fixed area or the entire screen. Version 4.31.1 is a freeware program which does not have restrictions and it's free so it doesn't cost anything. For security reasons, you should also check out the Screenshot Captor download at LO4D.com which includes virus and malware tests. Additional screenshots of this application download may be available, too. 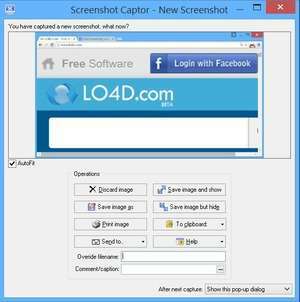 Screenshot Captor has a presence on social networks.